There’s a Toyota on the lots that’s more versatile than a Swiss Army Knife. Do you want power from your vehicle? Premium towing ability? How about cargo room and an ability to turn on a dime? The 2016 Toyota 4Runner, a mid-size SUV, embodies all of these things, and more. Let’s take a long look at the 2016 Toyota 4Runner in Brampton ON. The Toyota 4Runner is the ideal vehicle if you want to hop in and take the gang along for a trip – it doesn’t matter if you’re headed to see the grandparents or taking off for a hiking trip on Canada’s highest peaks, the 4Runner can handle the freight. The 2016 Toyota 4Runner has models that fit up to seven comfortably, and it can tow up to 2,268 kg (5,000 pounds). Besides the sheer tonnage you can bring, there’s space for 2,500 litres (89.7 cubic feet) of cargo, which is exceptional for a mid-size crossover vehicle. The 4Runner is one tough hombre that adapts quickly to any situation. 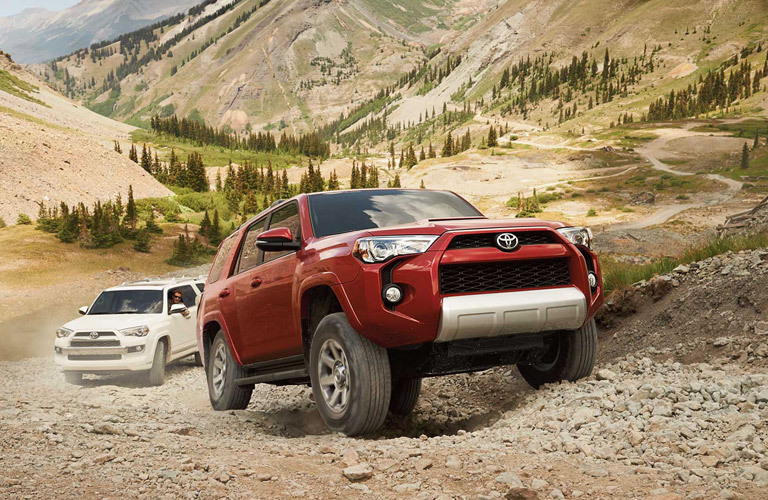 So while it may not surprise you that the 2016 Toyota 4Runner has a power output of 270 horsepower, it has some capabilities that just might catch you off guard. The 4Runner has a 37.4-foot turning circle, which means it can make a curb-to-curb turn as well as many sedans. In addition, this nimble piece of machinery can drive off-road as capably as it does on the highway, so you can brave the hills of the Canadian tundra with ease. You just might want to leave the kids at home before you do so. We all want to prevent accidents before they happen, and Toyota has stocked the 2016 Toyota 4Runner with its Toyota Star Safety System package to accomplish this. The package includes intuitive features like Traction Control (TRAC), Electronic Brake-force Distribution (EBD) and Brake Assist (BA), so you’ll feel safe wherever the road takes you. Check out some of the cool extras included with the 2016 Toyota 4Runner. It comes with a backup camera so you’ll be less likely to strike something on the way out of the driveway, and a power moon roof, so you can howl along with the wolfs at night, if you so desire. The Toyota 4Runner also safeguards your cargo, with roof rails for skis or other precious items, and trailer sway control so whatever you’re towing doesn’t swing out of control. And if you’re looking to relax while you’re on the go, the Toyota 4Runner has available ventilated front seats and tinted rear privacy glass which comes standard. Attrell Toyota is located at 110 Canam Crescent, Brampton, Ontario, L7A 1A9, and we have plenty of 4Runners as well as other models like the Corolla, the Camry, or the Rav4 in stock. We serve the greater Mississauga and Toronto area as well. Please contact us at 905-451-7235 or come visit us today to see our cars or to take one for a test drive.